My first Mac was a 512K Fat Mac — the model between the original 128K Mac and the Mac Plus — purchased in October 1985 for about $2500. Before that, I’d applied for a consumer loan to buy a Kaypro luggable, but they turned me down, apparently because I was fresh out of college, had no job and the Oklahoma economy had just crashed. 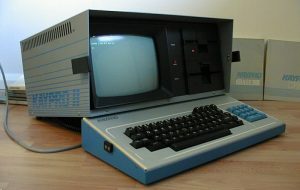 A Kaypro II personal computer circa 1982. Because in the eyes of Kaypro I was a loser, for a year and half I wrote articles using a typewriter from my ghetto apartment near 10th and Blackwelder in Oklahoma City. In fact, I was renting a typewriter to write my stories for the Dallas Morning News, the Oklahoma Gazette, the Daily Oklahoman and others while just barely making the rent. 30 years ago last week, Apple introduced the original Macintosh. I remember the first time I saw one in the window at a computer store in downtown Oklahoma City. I could tell even then that it was magical and would be part of my destiny. In early 1985, after I had moved to Norman, I started doing a newsletter for the Oklahoma Film Office. I would drive 45 minutes north to a shop called Alphagraphics that had laser printers and rented time on Macs with Ready, Set, Go! desktop publishing software. I think floppy disks cost like $5 each and printouts from the Apple laser printer were $2 per page. After a few months, I got to a point where I was spending a couple of hundred bucks in gasoline, Mac rental and laser copies so I decided to apply for a loan to get a Macintosh. Miraculously, I was approved by Apple and I started making payments of about $150/month, which was real money back then. I met my friend Karen because she had a small desktop publishing business and would let me print laser copies for a $1 per page just a few blocks from my house. My first software was actually a RAM disk utility that split the Mac’s 512 kilobytes of memory in half so you could load the operating system and your software into memory and keep larger documents on a floppy disk. Later, I owned a Mac II, an SE/30, a Powerbook 145, a Performa 600, a Mac LC, a Power Mac Workgroup Server 6150, a Power Mac 7100, a Power Mac 8500, a Power Mac 9500, a Powerbook 3400, a Power Mac G3, assorted Power Mac G4s, a Power Mac G5, a 2007 Macbook Pro, a 2010 Mac Mini and now a 2012 Macbook Pro — not necessarily in exactly that order. But I’ll never forget that first ugly Mac that I used to make dozens of publications, help produce three feature films and a bunch of commercials, edit a book, write databases, develop my skills and find my niche.